The New General Catalogue or NGC contains 7840 entries and forms the core of most people's "life list" of observing targets. The NGC was originally published in 1888 by J.L.E. Dreyer and therefore predated photographic astronomy. The Finest NGC list, compiled by Alan Dyer and published in the annual RASC Observer's Handbook, complements the Messier Catalogue, as there is no overlap. The list of 110 deep-sky objects includes many fine deep-sky treasures as well as a few some mildly challenging objects. Open Clusters 12 Including the famous Double Cluster in Perseus, NGC 7789 in Cassiopeia and NGC 6633 in Ophiuchus. Globular Clusters 2 NGC 5466 in Bootes and NGC 6712 in Scutum. Bright Nebulae 14 Includes the great Veil Nebula as well as the North American and Rosette nebulae. Planetary Nebulae 24 Includes many fine PN's like the Ghost of Jupiter, the Cat's Eye, the Blinking Planetary, the Helix, the Blue Snowball and the Clown Face nebulae. Galaxies 58 Includes the amazing NGC 4565 in Coma Berenices, NGC 253 in Sculptor and NGC 5907 in Draco. The Finest NGC certificate has been awarded since 1995. Observing the Finest NGC list is an excellent project for those who have completed their Messier Certificate and who are looking for a new visual observing program. A 200 mm telescope is recommended to complete the list although it can be done with a 150 mm telescope under good skies. Several Finest NGC objects can be observed in even smaller instruments so these could be used to get started on the brighter objects. With all instruments, a nebular filter will enhance the view of the faint glowing clouds of gas. Objects can be observed in any order. RASC members can apply for a certifcate and pin using applications forms at the bottom of the page. There are two versions of the certificate: Traditional (star-hopping) and Computer-aided (GoTo). 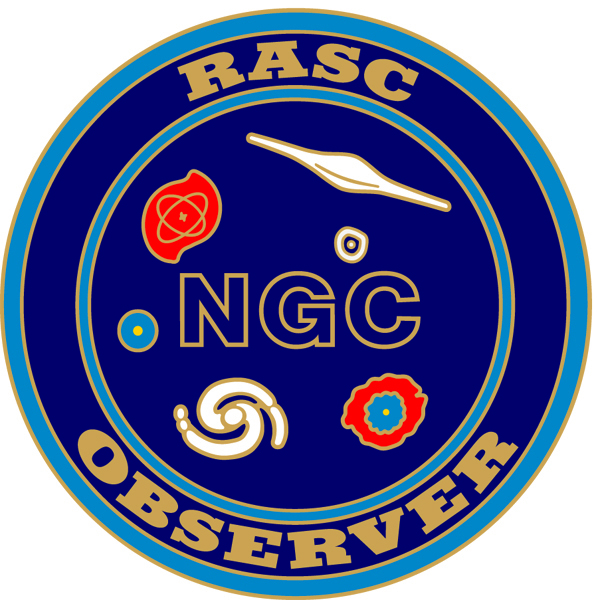 The RASC Observing Committee has created special observing forms to help you complete the Finest NGC certificate program. These Finest NGC observing forms (677 KB, 115 pages) will help to keep your observations in one organized file. They feature all of the important data about each Finest NGC object and a generous area for making notes and drawings. Sky Atlas 2000 - by Will Tirion is an excellent sky chart set that contains all of the objects on the Finest NGC list. The Night Sky Observer's Guide (Volumes One and Two) - by George Robert Kepple and Glen W. Sanner contains descriptions and finder charts for most of the objects on the Finest NGC list. Find out details about the Finest NGC Objects certificate here.